STILLWATER, USA – September 11 marks a decade since tragic events changed the Nation forever, and KICKER® Performance Audio was humbled by its inclusion on a custom Chevrolet truck inspired by 9/11 heroes and first responders. Donated and funded by General Motors, the majestic 2011 Chevy was unveiled at Ground Zero on September 6 for families and friends who lost loved ones 10 years ago. The Silverado 2500HD Crew Cab was gorgeously airbrushed by Mickey Harris, an internationally renowned artist identified by his intricate detail work. On the truck body, Harris painted memorable depictions of 9/11 first responders in action, as well as symbols of American freedom. 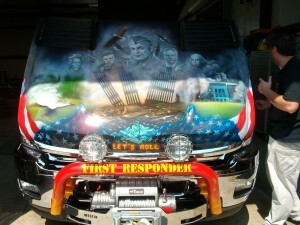 A 13 ½-foot, reverse tonneau cover displays the names of more than 400 first responders. “I love my nation, and the first responders deserve to be recognized as the brave heroes that they are,” Harris said. Knowing impeccable sound would be a huge part of the presentation, Harris requested KICKER for the Chevy’s audio source. Within the months spent on the project at Mountain Muscle Cars in Cosby, Tenn., 2 ½ weeks were put aside to install the audio system. Myers and KICKER acoustic engineer Deon Bearden designed both an internal audio system and an external one for paramount effect. They loaded four 15-inch CompVX subwoofers into a 49-cubic-foot, tapped-horn enclosure, with each driver powered by its own IX-Series 1,000-watt mono amplifier. Externally, mounted between the cab and running boards are three pairs of KM6500.2 HLCD (horn-loaded compression-driver) Tower Speaker Systems and two additional pairs of KM6500 midrange speakers, which are all driven by four space-saving IX500.2 stereo amps. Sixteen wake-tower cans made for boats were also donated by KICKER dealer AudioFormz and owner Ronnie Cherry in Wills Point, Texas. Two 300-amp Ohio Generator alternators and Kinetik high-current power cells help meet the system’s intense power demands. Harris said other aftermarket products involved in the completion of the 9/11 Chevy include SATA spray-gun technology, Street Dreams by Ross hinges for the reverse hood and tonneau cover, Transtar Autobody Technologies refinishing products, Westin Automotive truck accessories, Whelen strobe lights and police sirens, Auto-Air Colors custom paints, Badger air-brush components, Bushwacker fender flares and Hutchins Manufacturing air sanders. KICKER personnel Tracy Focht and David Glasgow made the trip to Ground Zero September 6 to witness the unveiling of the first-responder truck, while also sending thoughts and prayers from the entire KICKER family to those affected by 9/11. The Chevy will next make an appearance at the Pentagon on the actual anniversary day and at the 2011 SEMA (Specialty Equipment Market Association) Show in Las Vegas this November.